As part of routine maintenance of highways we need to cut extensive amounts of grass along the highway verges including on uneven ground and up and down embankments. We know that slips, trips and falls are some of our bigger risks, and that alternative plant to carry out these tasks can include use of vibrating tools (e.g. strimmers) with associated risk of HAVs (hand arm vibration). Of particular importance was the fact that 81% of our activities are carried out at night to reduce disruption for road users, but leaving increased risks of carrying out these activities at night in the dark. 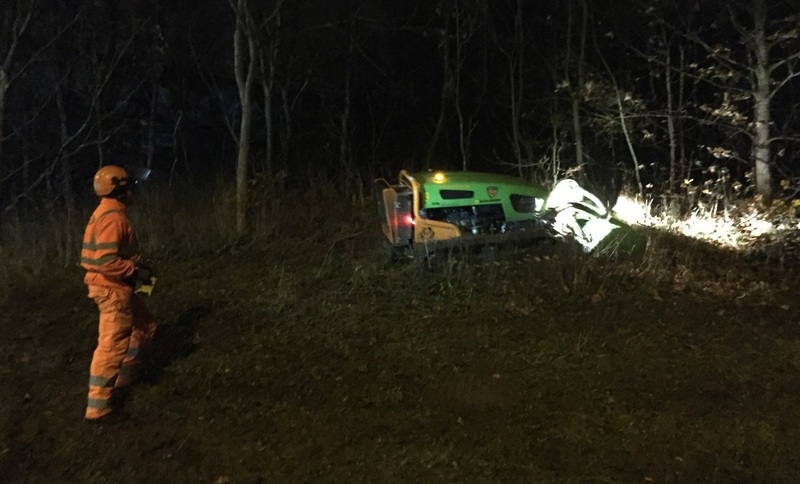 We researched alternative means to carry out grass cutting and trialled the Green Climber, a remote controlled grass cutter which can scale embankments so the operator does not have to. This eliminated the risks of slips, trips and falls on uneven embankment slopes, and also eliminated the HAV risks associated with alternative means. We also discovered as a secondary benefit that the equipment can cover an estimated 3 or 4 persons work in the same time allowing increased output per shift and increased value. So the use of this alternative equipment benefits our workforce safety by eliminating foreseeable risks.